Jerry Stitt was involved in the University of Arizona baseball program for more than 27 years as a player, assistant coach and head coach. He mentored 59 position players that went on to be drafted by major league teams and he helped Arizona win NCAA Division 1 championships in 1980 and 1986. As head coach at UA, he led the Cats to back-to-back winning seasons from 1997-99 and a return to post-season play in 1999. 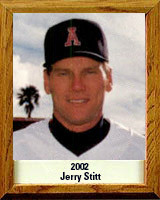 In 1998, Coach Stitt was included in the Arizona Daily Star’s “98 for 98” list of Tucson sports personalities. Major league hitters who learned from Stitt while at UA include George Arias, Tommy Barrett, Casey Candaele, Jack Daugherty, Terry Francona, Chip Hale, Ron Hassey, Jack Howell, J.T. Snow and Dwight Taylor. Stitt had an outstanding playing career prior to his coaching days. He was a first-team ABCA All-American center fielder for Arizona and was drafted by the Cleveland Indians.